There are two main invasive species of moths that are causing problems for households in New England. Its larvae commonly known as waxworms are a common grain-feeding pest found around the world, feeding on cereals and dry grain products. 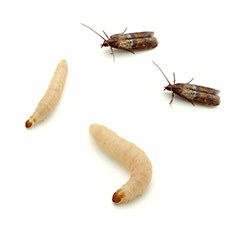 Signs of pantry moth infestations include larvae in cabinets, on upper walls, food packages and flies in the kitchen area. Feeding on clothing and natural fibers; they have the ability to turn keratin, a protein present in hair and wool, into food. Clothing moths prefer dirty fabric and are particularly attracted to carpeting and clothing that contain human sweat or other liquids, which have been spilled onto them.